The Chroma 6310A series Programmable DC Electronic Load is ideal for the test and evaluation of multi-output AC/DC power supplies, DC/DC converters, chargers and power electronic components. It is designed for applications in research and development, production, and incoming inspection. The system is configured by plugging the user selectable load modules into the system mainframe. The user interfaces include an ergonomically designed user friendly keypad on the front panel and the following computer interfaces: RS-232, USB or GPIB. The 6310A series can simulate a wide range of dynamic loading applications. The waveforms programmable parameters include: slew rate, load level, duration and conducting voltage. In addition, up to 100 sets of system operating status can be stored in EEPROM and recalled instantly for automated testing applications. Real time measurement of voltage and current are integrated into each 6310A load module using a 16-bit precision measurement circuit. The user can perform on line voltage measurements and adjustments or simulate short circuit test using the user friendly keypad on the front panel. Additionally, the 6310A series offers an optional remote controller for automated production lines. The 6310A series has a self-diagnosis routines to maintain instrument performance. It also provides OP, OC, OT protection, and alarm indicating OV, reverse polarity to guarantee quality and reliability for even in the most demanding engineering testing and ATE applications. Application of Specific Load Simulation The 6310A load modules operate in constant current, constant voltage, constant power or constant resistance to satisfy a wide range of test requirements. For example, the test of a battery charger can be simulated easily by setting the load to operate in constant voltage. The programmable slew rate makes the simulation of transient load change demanded by real life applications possible. 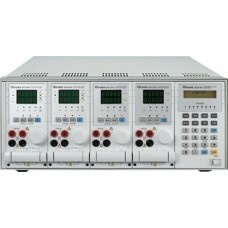 The 6310A internal waveform generator is capable of producing a maximum slew rate at 10A/μs, and dynamic cycling up to 20kHz. Parallel Control The 6310A provides parallel control, which enables high power testing when a single module cannot meet the requirement of high power applications. Two or more load modules can be paralleled together to achieve the desired loading. The 6310A comes with RS-232 as standard for remote control and automated testing applications. The USB and GPIB interfaces are available as options. Powerful Measurements Each 6310A load module has an integrated 16-bit precision A/D converter for voltage measurement with an accuracy of 0.025%+0.025% of full scale. The built-in resistive load current sensing circuit is capable of measuring current with an accuracy of 0.05%+0.05% of full scale. 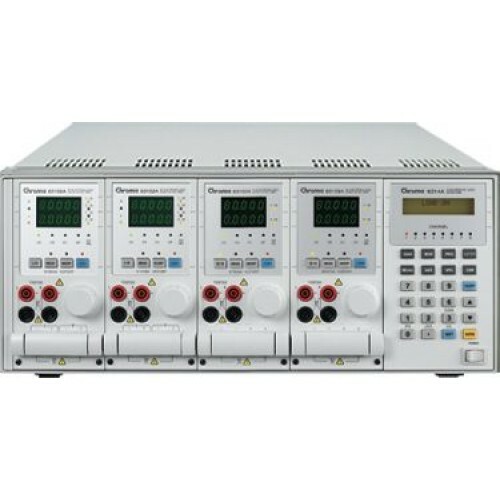 OCP Test By simply choosing the channel and setting the OCP parameters (start current, end current, step current and dwell time) from the front panel, the 6310A series provides a fast and easy OCP testing solution. The 6310A series will automatically detect the OCP point, making it an ideal solution for design verification as well as production line testing. Timing Function The 6310A series of loads include a unique timing & measurement function, which allows precise time measurements in the range of 1ms to 86,400s. This feature allows the user to set the final voltage & timeout values for battery discharge testing and other similar applications. Digital I/O The digital I/O interface makes the 6310A DC Load the ideal choice for automated testing requirements. Through the digital I/O, the 6310A can accept digital signals to trigger its functions (Load On/Off, OCP test, etc.) as well as current output status signals.